Anyone who has read a blog lately is sure to have come across a number of “life hack” articles. 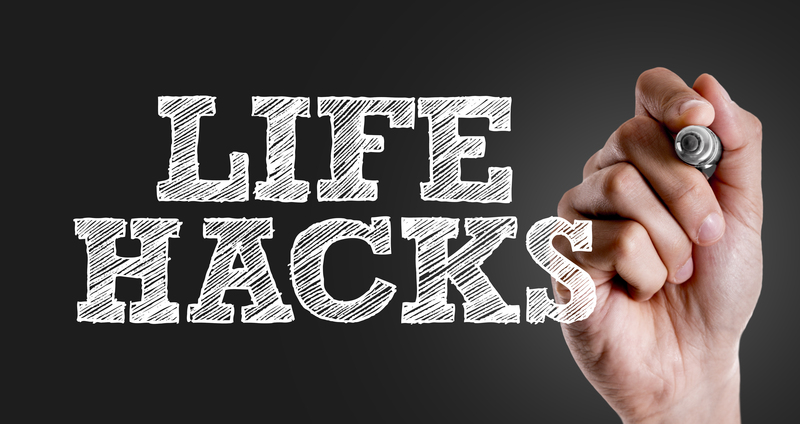 While most of these life hacks seem to be somewhat impractical and others seem to be a complete waste of time, every once in awhile you get some cool and quirky tips to help make life a little easier. One source that is great for automotive car hacks is Autoblog and here are three of our favorite. Okay, so we understand that this one may be a bit odd. But with summer right around the corner, and camping season coming along with it, we thought this could be a beneficial bit of knowledge. Besides, anyone who has ever been camping knows the value of a knife and in case you forget your sharpening stone, this isn’t bad information to have. Let us preface this by saying that if you’re handling knives, please use extra precaution and unless you have prior experience with knives and the sharpening of knives this is not recommended. To start, you will want to roll your window down about half way and position your knife at a twenty degree angle against the top edge of the open window. Begin gently running the blade along the window’s rough edge as if you were using a sharpening stone. If you are not familiar with this motion, check out a YouTube video or consult a knowledgeable friend. Be careful not to apply too much pressure, as you do not want to break or chip the window. Complete this process a few times and voila - car hack number one achieved! Note - while many people call this the “knife sharpen” hack, what is really being achieved here is knife honing. The same way you would run a blade up and down a honing steel that comes in a knife set, is the way you would run the blade across the window. Honing a blade basically pushes the edge of a the knife back to the center and straightens it, whereas sharpening is the actual process of grinding and shaving pieces of the blade off to produce a new, sharp edge. So, while this will surely help in a pinch, remember - you’re honing … not sharpening. Yes, this actually works and there is some science behind it. Keep in mind, that this is only going to give you a few more car lengths of reach, but it’s pretty cool to know nonetheless. Your brain can actually act like a radio transmitter that will increase the signal to your key fob remote due to the interaction between the electromagnetic waves of the key fob and the water within you skull. When electromagnetic waves go through water, they pull positively and negatively charged hydrogen ions in opposite directions, pushing them both upwards and downwards. As they go up and down, they radiate energy like a transmitter. As the water in your head carries the electromagnetic wave on the same frequency as the remote’s wave, they are added together and the radio signal of your car key is extended. This is definitely one of those hacks you have to just test out to believe it. It’s pretty easy to achieve. Just back up from your car until you are out of the remote’s range and then put it to your head for added distance. Again, it’s not much … but it’s something! Over the course of your car’s life, the headlights will suffer a lot of natural wear and tear from the outside world. The UV rays from the sun especially have a lasting effect on clear plastics. And even though your headlight housing is often coated and sealed by factory UV protectant, eventually this block wears off. Add weather, dust, debris, bugs, and other road hazards, and the lifespan of your headlight cover can be shortened. Remember that toothpaste is a mild abrasive, meaning it just naturally works well to lightly polish and fix small scratches. And this process is easy enough to achieve. Simply apply a small amount of toothpaste on a rag and rub in small circular motions until done. Literally, after only a few passes the results will be noticeable. Keep in mind that for deep scratches and prolonged exposure to UV rays and road debris, you may need something more heavy duty than toothpaste. Like all of these hacks, they are generally temporary fixes to hold you over until the problem can actually be solved. Toothpaste may allow you a couple of months of cleaner lenses, whereas a good sealant or wax may allow you a couple of years. But if your goal is to get a few more miles out of your ride without dropping a pretty penny for some sealant, then this is the hack for you. The list of car hacks could go on forever. From using the seat warmer to keep your food warm, to using a shoe as a cup holder, many lists provide humorous, yet often impractical hacks. While these three car hacks aren’t the ‘be all end all’, they are some fun bits of knowledge that may help out when you find yourself in a bind. If you find yourself wanting to try these hacks out on something new, feel free to visit our extensive online inventory today!